I say, "Hallelujah — a perfect example of divine justice." 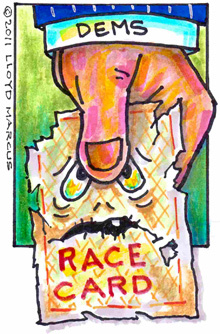 They who live by the race card die by the race card. Basking in their tactical genius, Democrats thought, "We did it! We pulled off the perfect exploitation of race to implement our socialistic agenda — a liberal black man in the White House." Someone at the DNC even broke out their old Commodores record as they partied: "Ce-le-brate good times, C'MON!" Totally unexpected and to the horror of the Democrats We The People rose up. Patriots, via divine inspiration, formed the Tea Party. Patriot freedom-fighters began winning skirmishes around the country — governorships in New Jersey, Virginia, and Florida — and defeating the tyrannous teachers' union in Wisconsin, to name a few. We took the House. We will take the Senate and are predicted to take the White House in 2012. The Democrats' ebony idol, their so-called gift to America, has been exposed for the fraud it truly is — a hollow, soulless shell of empty liberal ideology, its internal recorded message malfunctioning and distorted, stuck repeating the phrase, "I blame...I blame...I blame..."
Ironically, the Democrats who claim ownership of Dr. Martin Luther King, Jr., shamefully dishonor his dream. The Tea Party, vilified by the Democrats, fully embraces MLK's dream by judging and selecting their candidates by the content of their character rather than the color of their skin. Thus, the Tea Party, much-hated by Democrats, is the realization of MLK's dream. And for the record, MLK was a Republican. The Democrats played the ultimate race card — an incompetent affirmative-action president, and now they are stuck with him. The faux finish on their once-shiny ebony idol is rapidly deteriorating, peeling off daily. Come 2012, Obama is a sure loser. "Ce-le-brate good times, C'MON!"